As a full-time mountain trekker and traveler, I’m always concerned about how to sustain my gadgets’ battery life. This is a common concern especially when I’m out on the mountain trails hiking over a number of days. 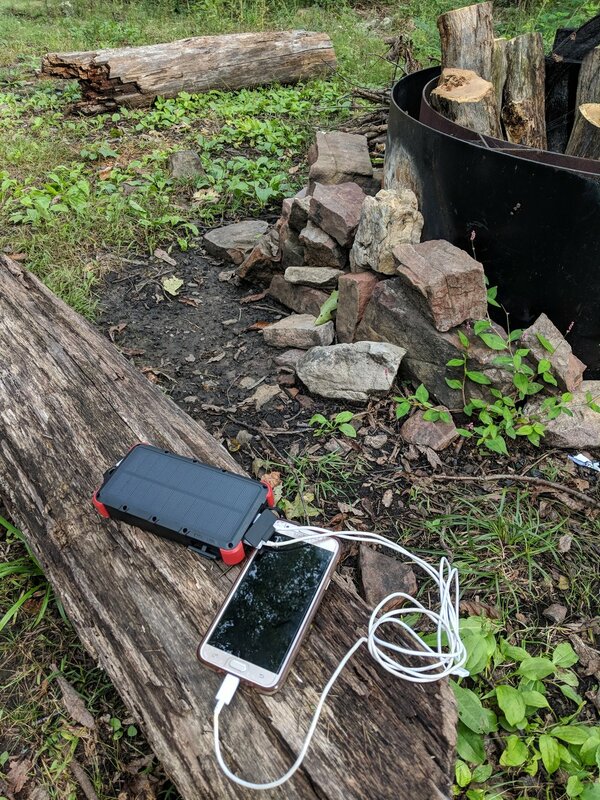 In my recent trip with the women from my backpacking class in the Washington, DC area, I managed to test my new battery charger, OUTXE Savage. My beginner backpacking class ventured on an overnight backpacking trip at George Washington National Forest, which is a two hour drive from Washington, DC. We backpacked a total of eight miles with 1200 feet in elevation gain, which makes the experience a perfect beginner friendly backpacking trip. OUTXE is noticeably fast. In fact, it’s faster than most of the chargers I’ve used on my previous treks. Charging my Android from 20% to 90% took about 25 -30 minutes. I was able to use my gadget in no time. It’s heavy duty and durable. On our trip, we had rain and wind plus I dropped my OUTXE a few times as a I was setting up camp hurriedly in such bad weather. OUTXE was fully safe and sound despite the rugged use of it on the trail. I witnessed its functionality being dustproof, shockproof and waterproof - it performed great in those aspects. Dual charging is a plus. As I do have a few gadgets that I bring with me, I found the dual charging to be of great help in terms of making sure I have access to a camera to capture all my outdoorsy moments or when I want to ensure I can remain connected via phone call, text or data. The speed and efficiency of charging my gadgets definitely increased with OUTXE. It’s handy and easy to carry. The carabiner that comes along with it is a nice addition so I can attach it to my pack easily and never have to scramble to find it. What a simple and yet super practical idea. We had a view of the mountains bordering Virginia and West Virginia before the downpour. Granted I have not tried OUTXE’s ability with solar charging, but so far I’m impressed with its features. With a short trek, I don’t foresee the need to even make use of its solar charging capacity given that the portable charger’s power capacity of 20000 mAh. OUTXE is ideal for short overnight trips - whether backpacking, camping, a road trip or even for travels where you anticipate limited access to a wall plug. On thru-hikes or backpacking trips that go on for three or more days OUTXE’s weight may be a bit of a challenge as it weights 1.15 pounds. As a long distance hiker, this is a consideration but with packing smartly, it’s still doable and would be a great way to lengthen the usage of one’s gadgets. Learn more about OUTXE here.